To decide the shading, our cel shading materials requires light direction, intensity, and color. They are basically stored in the CharCelShadingParameter parameter collection in CartoonRenderingPack folder. Although users can change the values in the parameter collection directly, our pack provides a more intuitive way to control the lighting by a custom light blueprint class, BP_CCSP_DirectionalLight. 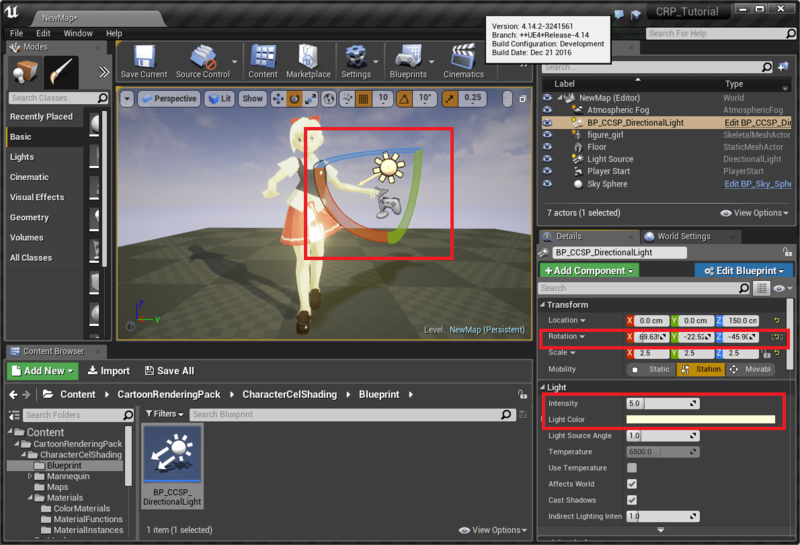 Please find more information about lighting in Controlling Lights in Cel Shading. We now find BP_CCSP_DirectionalLight in CartoonRenderingPack\CharacterCelShading\Blueprint and add it to the scene. 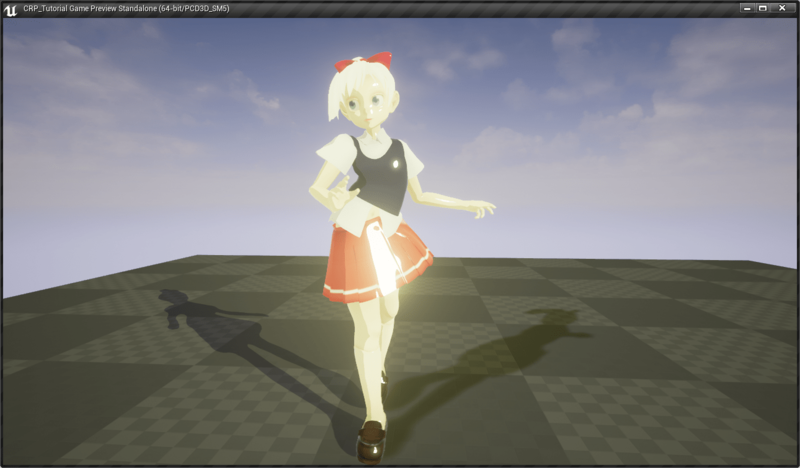 Once added, we can change the cel shading look by rotating the light direction, changing the light intensity, and changing the light color. 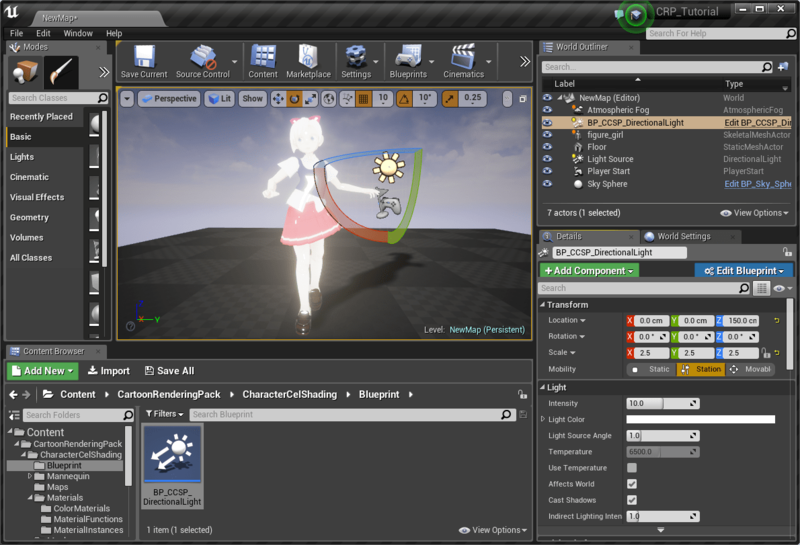 By adding the light, we can interactively change the cel shading in the unreal editor. 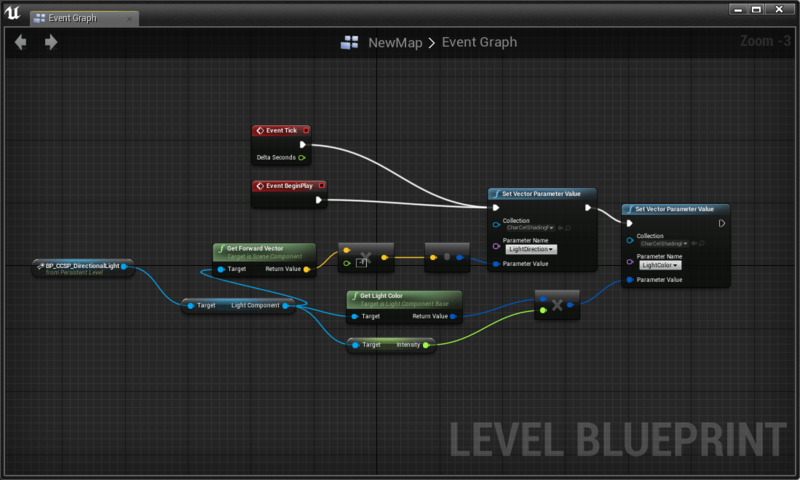 However, it actually does not work in the game mode without adding some more blueprint logic to the level blueprint. We find the necessary logic in our sample stage CCSP_BodyShading_Overview in CartoonRenderingPack\CharacterCelShading\Maps, and copy-and-paste the logic to our level blueprint. When we paste the logic to our map, we can see there is an Unknown node. The Unknown node was originally the cel shading light node in the CCSP_BodyShading_Overview map, and changed to Unknown because there was no actor having the same name in our level. We replace the node by our cel shading light BP_CCSP_DirectionalLight by drag-and-drop the actor in the world outliner to the event graph. Now we can see the light also work in the game mode, too.